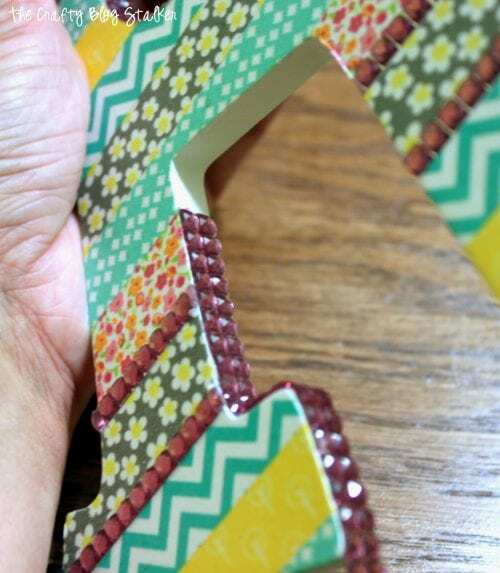 Decorate a monogram letter using washi tape. Makes for great home decor or wall art. An easy DIY craft tutorial idea to decorate your space with washi tape. Putting strips of washi tape on a letter is not a new idea, but this is such a fun and simple craft that I just had to share it with you! 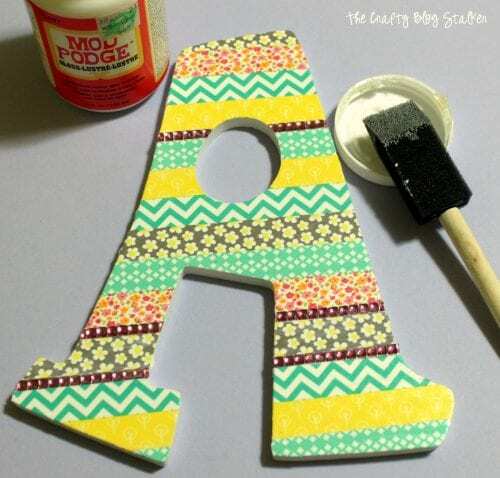 Begin by adding strips of washi tape to the wood letter. Laying the next strip right next to the one above. After the wood letter is covered with washi tape it’s time to apply the Gems around the edges of the letter. The sheet of sticky Gemz cut apart really easily so I added a few strips of single Gemz to the front. Once the front is covered in the strips of washi tape and sticky Gemz, turn it over and with an exact-o knife cut away the extra. 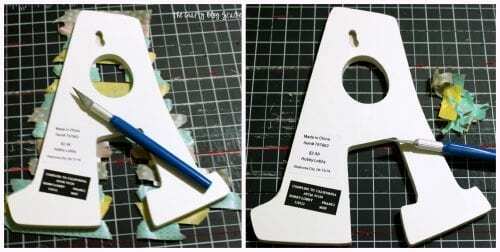 To seal the tape and secure it to the letter, apply a thin layer of Mod Podge. The Mod Podge doesn’t take very long to dry – only 15 to 20 minutes. When it is all dry, cut double strips of the sticky Gems to wrap around the edge of the letter. I think it turned out fabulous! Now to find the perfect spot to hang it in my daughter Allie’s room! What have you made with Washi Tape? Share and leave a comment below! 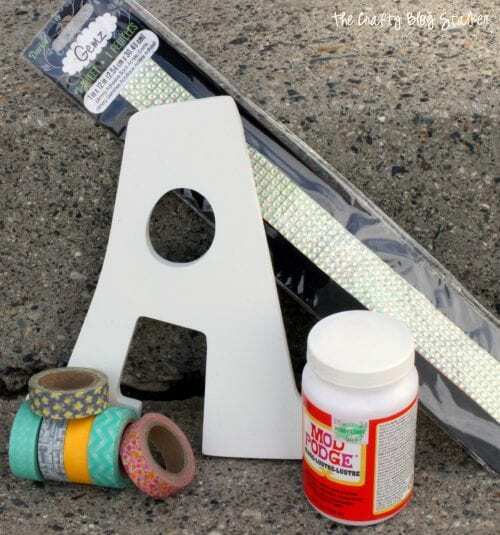 SAVE HOW TO MAKE A DECORATIVE WASHI TAPE LETTER TO YOUR FAVORITE DIY PINTEREST BOARD! Hi There, Super cute,Super easy and Super WOW!!! Hello! Great job! Love it.. Very Cute!! Love the idea! Such a cute idea! I love it!! I have been hearing so much about the Washi tape. I have got to try it. That is so cute!! I could use this to put letters on my daughter’s wall. So neat! Pinning for sure…. Super cute! Love the colors of the washi tape. So cute. I am having my first baby and this might need to be a little project for the nursery! I love the bling on the sides…totally makes it stand out! Oh Katie, this is a fab idea! I am going to use it for the Etsy Craft Party I am organizing and I will credit this to you! What a great idea! I am going to try your idea for a scrapbook page this summer: use my Big Shot to diecut some letters and then apply Washi tape to decorate them! TFS. Found you via Creative Mondays linky. This turned out really pretty, I love how you added rhinestones! This is sooo cute! I am in the process of doing my cookie/craft room, and this would be a perfect project to make to bang on the walls. I love all of the different patterned washi tape they make, I can never pick just one to use, thanks to you, I can use them all. Thank you for sharing. Adorable! I love your added gems. Would be a great project for my daughter and her friends this summer! Thank you for stopping by the Weekend Social over at Kitchen Dreaming, hope to see you again next week. I love this idea! I haven’t seen it done before so I am really happy you shared! It is simple but so cute!